I missed a scheduled posting for my Hospital Hill Run Blog team, so I will plan to more than make up for it in in April and May. I did actually take a little more time off from training than I should have because of various reason but I have been hitting it really hard in January and February and so a little extra recovery time in March. I have also been putting in some extra workouts in with strength training, so my body had been adjusting to that. In reality, February and March make up my off season. My ironman training officially starts on Monday... with a rest day. Since I neglected my weekly reviews this month, I missed telling the story of a treadmill run earlier this month. I had planned to run outside and get in a 14-16 miler but with the weather I moved inside. Instead of taking up a treadmill for that long, I decided to make it a threshold run. So I set the treadmill for an hour and set the goal of doing 8 miles in an hour. This is an average pace of 7:30 minutes per mile. I have only done this once before during a training run (and I did rest about every 3 miles) and I managed that time in a few races last year. It was going to be a challenge, even with the use of a treadmill. I started the thing at 8:15 pace and every mile I sped it up by 15 seconds. The first 5 miles felt great! Heart rate was in check. Once I had completed 7 miles, I had 6:30 left on the clock to finish. I pushed it to 6:30 pace. Now I was definitely feeling it! I was excited to see that I could flail my legs over and over on the belt to hit 8 miles. I was staring down the panel as the seconds clicked to 60 left. Then suddenly it turned off... the screen... the belt. It just gave up!!! After I cooled down on a different treadmill, the thing had physically turned itself off. As in the power switch was now in the "Off" position. These aren't final because I have one more day of the month which will include a bike ride. I'm hoping to get my tri bike outside for the first time since my initial pre-purchase test ride. Tomorrow we have Easter lunch with extended family, so the 90 minute drive to and fro may mean I won't be back in time to take it outside. We'll see. These sessions were either a one hour hard spin (20mph minimum) or a two hour ride. I definitely am seeing improvement, but I have a feeling it's going to plateau soon. I may start looking at those Sufferfest videos to use as training aides. Considering all the running I did in 2012, this really took a back seat to my other activities (training or otherwise). I do feel that I have lost some base in this area but I did test that this week. I did a real easy 7 miles on Tuesday, then a hard 10 miler Thursday. During this 10 miler I did manage 8 miles in the first hour (so I DID get it in without the aid of a treadmill while fighting wind and up hills). That 10 miler finished in 7:36 pace. For me that is an amazing. I already mentioned I did 15 miles this morning but I'm feeling much more beat up than I should. I signed up for strength training sessions back in January and we've completed nearly 2.5 months at roughy 2 sessions per week. I can tell it is helping on my running and TKB has commented about physique changes. I'm not trying to bulk up with this because I definitely need to be able to manage the physical pounding of a 140.6 mile race. No real excuses for neglecting the blog. My web development efforts really kicked up this past month and that's kept me focused mostly. Trying to get a new company's website launched and then revamping another web site due to a change of business lines makes for a busy month. It's hard to not be coding when I'm tip-tapity on the laptop. 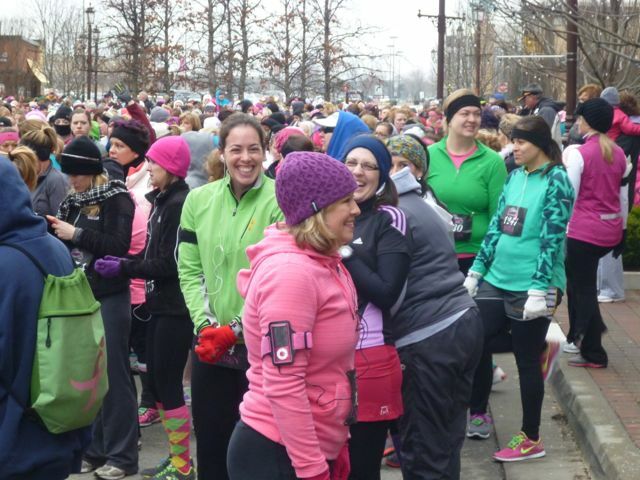 TKB and Lauren ran the Diva Dash 5k last weekend. I had the privilege of being an athletic supporter at a race for the FIRST TIME EVAH! So as I went to take a photo of them before the race, this lady stepped right into frame for a photo as well. Look for a "Athletic Supporter Race Report" soon! This blog post is part of a series of posts associated with the Hospital Hill Run Blog Team. For more information, see my original post. To see all blog posts, review those that are tagged as "Hospital Hill Blog Team". To register for the Hospital Hill Run, check out their website! Disclaimer: This post discusses some topics on muscle, energy, and oxygen science. As you may quickly note, I'm not a scientist nor a doctor but I do have muscle (a few pounds of it) and consume energy (not just electronic). Some of the information could be a bit off base so you may want to consult a true expert on the topic if you want in-depth information. In my last Hospital Hill Run post, I discussed the different sources of energy used to get the body movin’. More importantly, I discussed how and when the two main sources of fuel were used. How do we use that knowledge in training and racing? Friends, family, and coworkers occasionally ask me what’s the best technique for getting “in shape”. What’s the most effect method? There are many different styles of workouts that can be considered effective but I always focus on “Interval Training”. Doing intervals is actually something runners/athletes do after they’ve been training for a while. It’s not typically something you do right off the bat; however, I think it is something that can be added pretty soon after someone has started a workout program. According to this lovely Google search results, intervals is alternating running and jogging. For a triathlete that may also include cycling and swimming. This means that you will set out to run a “hard” pace for a certain distance or time. Once you reach the end, you will either walk or jog for another pre-set distance or time. Repeat. So what is a “hard” pace? If you are just starting your running career, I would say that it is a pace where breathing is starting to become challenging. This means that you are entering the anaerobic phase of energy burn. You aren’t getting enough oxygen to the muscles, so it will rely on sugars/glycogen for energy. This means that the “hard” phase of intervals is taxing your anaerobic system. When you ease up and start jogging or walking you enter the “recovery” portion of the interval. Recovery is a fairly accurate term for it because your body is freaking out a little. It’s thinking, “OMG! I just burned through a chunk of my glycogen supply! I better rebuild it!!”. So your body begins doing the necessary tasks to recover sugars and converting them into glycogen for storage in muscles. Your body doesn’t know when you are going to need it. In addition, there is a side effect to anaerobic exercise. Remember how when you run wicked hard, there is a pain build up in your legs? That pain build is likely contributed to lactic acid. It’s the nasty by product of the glycogen burn (kind of like the smoke from a fire in my previous post). Your body wants to get rid of that lactic acid, so your body uses anaerobic energy to clean out that junk from your legs. So what is really happening? In order to rebuild the glycogen supply and clean out the lactic acid, your body must use more energy to do so. Since you are walking or jogging now, your body can utilize the aerobic energy sources to rebuild the glycogen supply! Now you are taxing your aerobic system! What happens when you tax your body? Your body prepares it so it can better handle any future “taxing”. So in the first half of the interval, the “hard” half, you taxed your anaerobic system. In the second half of the interval, the “recovery” half, you taxed your aerobic system. In one workout, you are improving both methods of consuming energy! Brilliant! The key here is to repeat the process. You need to continue doing this during a workout so your body gets confused. If you just do it once, it may write it off as a random occurrence but as you continue, your body will have no choice but to prepare. The “hard” portion of the interval works your anaerobic system. The “recovery” portion of the interval works your aerobic system. When first starting out, I don’t think a lot of focus is needed on how far or how long those intervals are or how slow the recover needs to be. My typical rule of thumb is that the recovery should be half the distance or time of the “hard” interval. If you are doing longer “hard” portions (like a mile) then you may not want to have your recovery be as long. When I started out I think I was doing 1 or 2 minute hard runs on the treadmill with recovery being half the time. Intervals can be done anywhere. They can be done on a track, on a treadmill, during a trail or street run (but they are harder to judge distance and effort). Besides the above benefits, doing intervals helps teach your body how to physically run fast so you become more of an efficient runner through your running form. It’s also a nice change to the daily run routine.